Mycellium, Bees, and Stardust are the central mysteries of the Living Love Revolution. This fall temple theme focuses on the bees that pollinate our food as well as the alchemy of becoming. 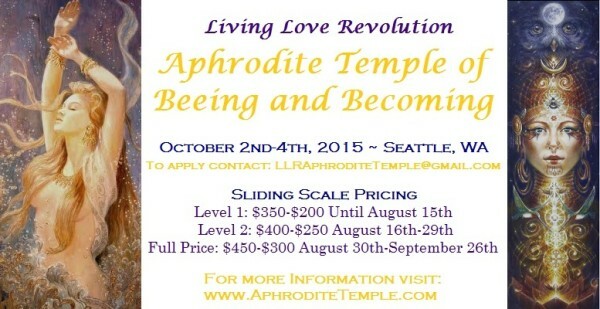 In this temple we work to manifest the vision of what Aphrodite Temple Culture is and can be: a functional, satisfied group of people who are dedicated to developing themselves as a resource of Transpersonal Love for themselves, their community, and the planet. This is the humming resonance of a hive busy working toward the sustainability and stability of the hive heart while also repairing their homes, their hearts, and their consciousness. In this state everyone is present and aware of their interconnection, thinking well about each other, and offering their love and care to each other and the environment while also maintaining their individuality, sovereignty, and authenticity. The focus on becoming is a focus on how we can move forward and take temple technologies into our daily lives and personal communities to further the pollination of Aprodisiacal living beyond temple experiences. As Fall moves us towards the inward hibernation of Winter, we bring the honey back to the hive to sustain us through the long nights. This temple will be at a private home in Seattle, WA. It will be a slightly smaller and more intimate temple than we have been doing lately due to the venue size, and will start at 1pm on Friday. Address given upon registration.